It’s no secret that TeamSnap’s culture is a great one. In fact, as of last week, we’ve been named No. 6 on Outside Magazine’s Best Places to Work: 2016 list. That’s the second year in a row TeamSnap made the list, and a 10-point jump over last year’s ranking! Six out of five employees say TeamSnap is the best place they’ve ever worked because of the emphasis on work-life harmony. We know work is only one part of your life, and although we’re all passionate about our jobs, we enjoy the opportunity to work flexible hours and work from anywhere in the world! Here’s a round up of photos of TeamSnap employees (rocking their TeamSnap gear, of course) from across the country and even the world! Interested in joining us? You’re in luck. We’re hiring. 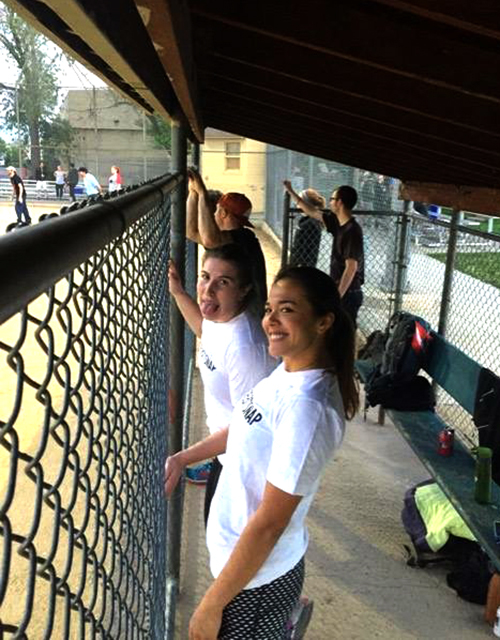 Sales Team All-Stars Aliza Shapiro (left) and Ashley Frese ham it up in the dugout of one of TeamSnap’s kickball games. The company sponsors the team, the Snapdragons, for employees in TeamSnap’s Boulder HQ. VP of Product Terri Schmier enjoys the occasional beach workday in California with her pup Baja. Not pictured: Terri. Partner Relationship Manager Brett Rhodes enjoys the time he gets to spend with his three kids while working from home. Here he is with the whole family, hiking the North Shore of Lake Superior in Minnesota. Android Developer Mackenzie Powers crosses the finish line of the Leprechaun Leap 5K in Tustin, California. Mackenzie lives in Los Angeles and enjoys the flexibility of being able to take mid-day breaks to go for a run. Lead Developer Randy Girard stands with his family atop Mt. Greylock in Western Massachusetts. Thanks to TeamSnap’s remote work environment, Randy and fam moved from Massachusetts to South Carolina last year to be closer to his family … and escape the snow. Director of Marketing Communications Stephanie Gonzalez (that’s me!) enjoys the fact that TeamSnap’s flex time gives her the chance to go for weekday hikes and walks with her husband and their pooch. She’s pictured here moments after said husband and pooch practically tripped over a 4-foot-long rattlesnake in Wynne, Arkansas. Developer Matt Hopson, pictured here in Palo Alto with his wife Kate, is one of the TeamSnappers who works from an RV traveling the country. About 10 percent of the company call the nomadic life theirs. Roxy Sears, a member of our Club & League product team, enjoys TeamSnap’s flexible schedule that allows her to travel the world. Here she’s pictured in beautiful Vietnam. Stephanie Gonzalez is the director of marketing communications for TeamSnap. When she’s not manning the marketing department’s helm, you can find Stephanie playing lawn games or working on her 95-year-old craftsman home in Memphis, Tenn.
TeamSnap Has 1 Million Teams!